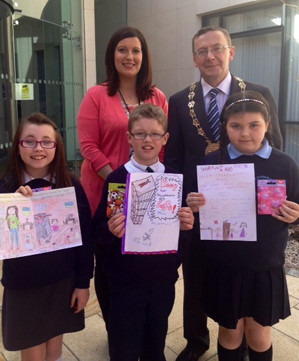 Local school children took part in a Home Accident Prevention poster competition. LOCAL school children were invited to Down Civic Forum to collect their prizes in a Home Accident Prevention poster competition. * Kayleigh Smyth, Legamaddy Primary School, Ballynoe, with their prizes after they won a recent safety poster competition. The competition was run by the Home Accident Prevention group and looked at accidents in the home. Also pictured is Patricia Gee, Environmental Health Officer.